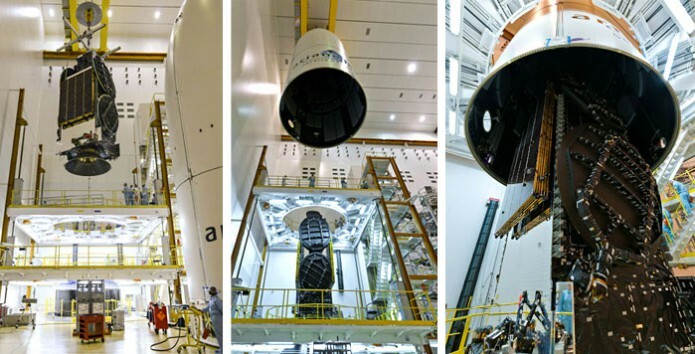 Ariane 5 launcher buildup was completed with the positioning of DIRECTV-14 – which is encapsulated in the ogive-shaped protective fairing – atop its GSAT-16 co-passenger (photo at left). This was followed by the application on Ariane 5’s fairing of graphics representing these payloads, marked by the corresponding DIRECTV-14 and GSAT-16 teams in the center and right-hand images. The Ariane 5 for Arianespace’s upcoming flight from French Guiana is now complete following integration of its two satellite passengers: DIRECTV-14 for operator DIRECTV, and the Indian Space Research Organisation’s (ISRO) GSAT-16 – both of which will be orbited on this heavy-lift mission planned for December 4. 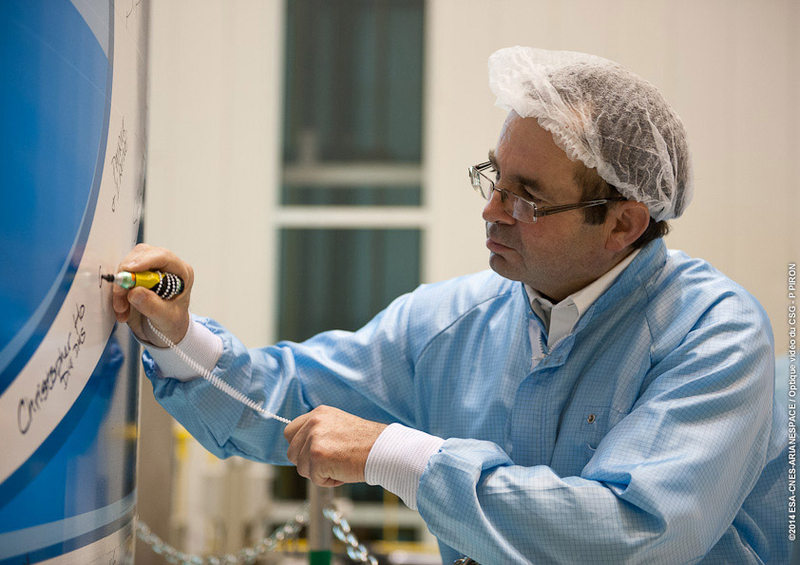 Christophe Bardou, Arianespace’s DIRECTV-14 Program Director, puts his signature on the Ariane 5 payload fairing. 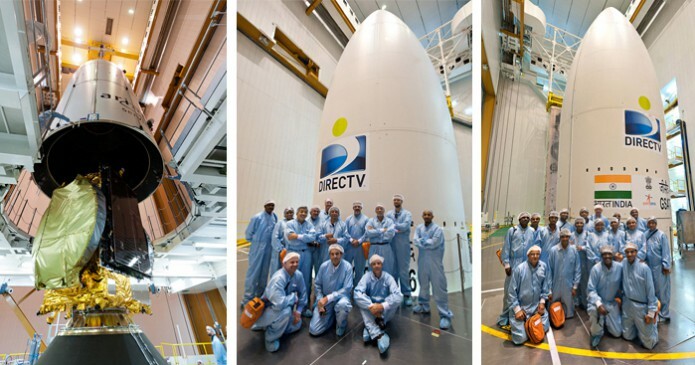 Encapsulated in the ogive-shaped protective fairing, DIRECTV-14 has been positioned atop GSAT-16 – which was installed on the launcher’s cryogenic core stage during activity inside the Spaceport’s Final Assembly Building for Ariane 5. These successful integration steps enable a new series of preparation milestones to begin. They include the launch readiness review on December 2, which is to be followed by Ariane 5’s rollout to the ELA-3 launch zone the next day. Liftoff is scheduled during a 1-hr., 10-min. launch window opening on December 4 at 5:38 p.m. local time in French Guiana, with the two spacecraft to be deployed on a flight lasting approximately 32 minutes. Ariane 5 will deliver a payload lift performance of more than 10,200 kg. during the mission, which includes a combined total of some 9,480 kg. for DIRECTV-14 and GSAT-16, plus the launch vehicle’s dual-passenger dispenser system and satellite integration hardware. After the related DIRECTV-14 and GSAT-16 payload graphics were applied to the launcher’s payload fairing, the various satellite team members made their mark – adding personal signatures and other messages ahead of Ariane 5’s December 4 liftoff.